If you haven’t heard the news yet, the Angry Birds movie Rio is getting a sequel Rio 2, and in celebration of the upcoming event, Rovio has released 20 new levels plus six bonus ones (based on the upcoming movie) in Angry Birds Rio. The update is called High Dive and the story revolves around the rescue of Amazonian river dolphins that have accidentally been trapped in underwater cages. You will dive into the cool blue waters of the Brazilian port harbor and help save those beautiful creatures in the inimitable style of the birds. 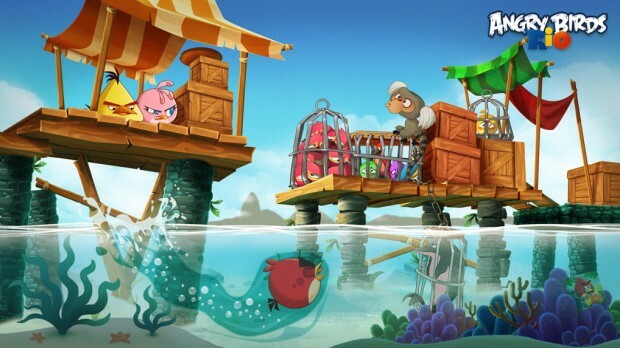 Rovio promises that the new update will bring in a completely refreshing style to the game that players have never seen before. There’s some scintillating Rio music from the Brazilian Barbatuques that is going to be featured in the movie and if you’d like to hear some of that while taking a dive in the cool Amazonian waters, you can check them out on iTunes. The Angry Birds Rio update is available as a free download. If you’ve already downloaded the game before, just hit that Update button.